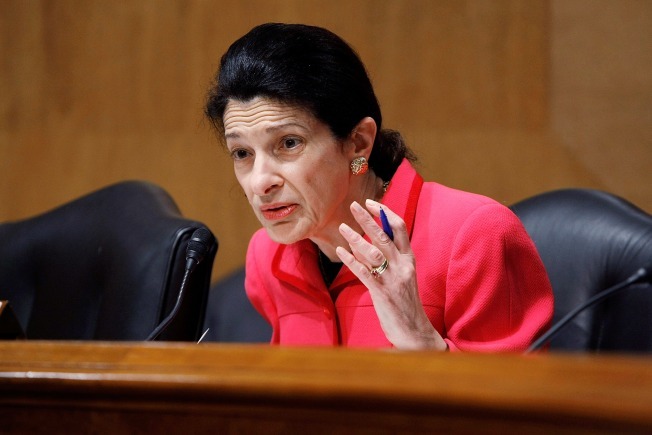 Sen. Olympia Snowe (R-Maine) notices that she’s part of a shrinking minority every time she heads to the Senate floor for a vote. Women make up almost 51 percent of the U.S. population but less than 10 percent of the House and Senate GOP — a gender disconnect that could make the Republicans’ climb back to power even steeper than it would be otherwise. Republican women in the House say they feel the problem — literally — when their male colleagues nudge them to the front of GOP press conferences to break up the solid lines of middle-aged white men in neckties. The numbers make that difficult. Out of 435 members of the House, just 17 are Republican women. Of 99 sitting senators, just four are Republican women. Of course, there are fewer Republicans than Democrats of either gender in the two houses. But even on a percentage basis, Republicans suffer a gender gap. Twenty-two percent of House Democrats are women, but only 9.5 percent of House Republicans are. In the Senate, nearly 23 percent of the Democrats are women, but only 10 percent of the Republicans are. The problem isn’t new; former Rep. Marilyn Musgrave (R-Colo.) remembers being struck that no Republican women were on stage while President George W. Bush signed a ban on partial-birth abortions in 2003. “I looked at the stage and said, ‘You’ve got to be kidding me,’” said Musgrave, who was sitting in the audience. But the imbalance seems to be getting worse. While the Republicans had Alaska Gov. Sarah Palin on their presidential ticket in 2008, Democratic women far outnumbered Republican women as general-election candidates for the House in November. There were 96 Democratic women on the ballot — but only 37 Republican women. In 2006, 70 percent of the women competing in major party primaries were Democrats, according to Laurel Elder, an associate political science professor and gender expert at Hartwick College in New York,. And, she says, only five Republican women have chaired congressional committees since 1995. Democratic women currently hold four chairmanships in the Senate and three more in the House — plus the speaker’s gavel, in the hands of Rep. Nancy Pelosi (D-Calif.). In addition, Rep. Carolyn Maloney (D-N.Y.) chairs the Joint Economic Committee. Republican women who have made it to the top — women such as Snowe and Reps. Cathy McMorris Rodgers, Lynn Jenkins and Virginia Foxx — say they’ve been warmly welcomed and mentored by the Republican leadership. But Elder said the GOP has to do more than just make female candidates feel welcome; it’s got to be aggressive in actively recruiting them. National Republican Congressional Committee Chairman Pete Sessions (R-Texas) is trying to do that. While Palin provided a high-profile role model for Republican women thinking of running for office, her experience was a double-edged sword. Lawmakers say the rough treatment Palin received showcased the nastiness of modern campaigns and underscored the notion that women are susceptible to the charge that they’ve been picked to run because they’re a good demographic fit — and not because they’re the most qualified. “For Republican women to say, ‘This is something I want to subject my family to’ — it’s a big role,” said Rep. Thelma Drake (R-Va.), who was one of the top political targets of left-wing organization MoveOn.org in 2006 and 2008. Drake lost her seat last year and says she is still angered by the effect scathing television ads had on her grandchildren. “It’s difficult to find people to run for office, and it will be more difficult in the future because of the tones in campaigns,” she said. The problem is also geographical. As political realignment shifts the GOP territory south, Elder said female candidates are vying to get elected in a region least hospitable to women, while Democrats are getting elected in the West and Northeast — areas that are more welcoming to female candidates. According to the center’s analysis of exit-polling data, women backed Democrats Barack Obama and Joe Biden over Republicans John McCain and Sarah Palin 56 percent to 43 percent. Male voters split their votes much more evenly, with 49 percent voting for Obama-Biden and 48 percent choosing McCain-Palin. Snowe says there’s also a political dimension. As the Republican Party sheds moderates, it also sheds women. Leadership has taken notice. The Republican National Committee says a critical first step is to be more all-inclusive when recruiting and training women. It says its Women’s Coalition is making an early push to identify women for 2010 as part of its 50-state plan. But the pool is shallow. State legislatures, which often serve as feeders for Congress, are also seeing fewer Republican women step up to the plate. Meanwhile, Democratic training outlets such EMILY’s List have been well-organized and highly successful at recruiting, while anti-abortion Republican womens’ groups, such as the National Federation of Republican Women and the Wish List, say they are bracing for another tough election cycle. McMorris Rodgers, who is helping lead the NRCC’s candidate recruitment team, says she’s bringing in groups of women from different regions of the country for tours of Capitol Hill in the hopes of getting some to run.